^ a b c d e f g h Brown, T, D. (1976). 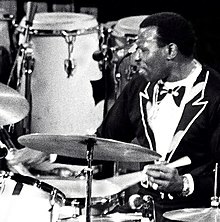 A History and Analysis of Jazz Drumming to 1942. University Microfilms: Ann Arbor, MI. ^ a b c Brown, T, D. (1969). 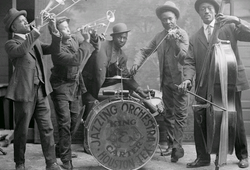 The Evolution of Early Jazz Drumming. Percussionist, 7(2), 39–44. ^ a b Washburne, C. (1997). The Clave of Jazz: A Caribbean Contribution to the Rhythmic Foundation of an African-American Music. Black Music Research Journal, 17(1), 59–71. ^ Burns, Kenneth and Novick, Lynn, & Burns, Kenneth. (2000). Jazz: A Film by Ken Burns. [DVD]. Florentine Films. ^ Lambert, J. (1981). "Second Line" Drumming. Percussive Notes, 19(2), 26–28. ^ Hutton, J, M. (1991). 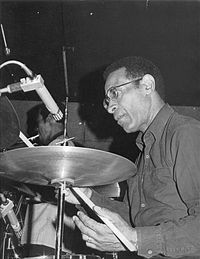 Sidney "Bid Sid" Catlett: The Development of Modern Jazz Drumming Style. Percussive Notes, 30(1), 14–17.